Air quality can severely impact and deteriorate irreplaceable paintings, documents, drawings, books and journals within a vault, storage area, library and exposition hall. Preserving these fine treasures from the ravages of mold, spores and bacteria are a priority for libraries, archives, museums and collectors. UV systems are designed to destroy airborne mold spores and their associated odors as well as bacteria that can very well destroy treasures from the past. Sanuvox UV CoiClean systems are designed to destroy mold and other bio-contaminants on the evaporator coil which results in spores as well as off-gassing being « blown-off » the evaporator coil & distributed through the facility. Sanuvox In-Duct UV Bio-Wall systems effectively destroy thousand of airborne bio-contaminants such as mold, bacteria, viruses, chemicals, VOCs and odors. OBJECTIVE: To destroy mold & bio-film on the evaporator coil and surrounding areas and to limit the spread of mold and fungi into the building. Maintain peak system efficiency, lower energy costs & reduce conventional coil cleaning as well as eliminating biological “blow-off” & odors that can be introduced into the building or facility as a result of a fouled coil. 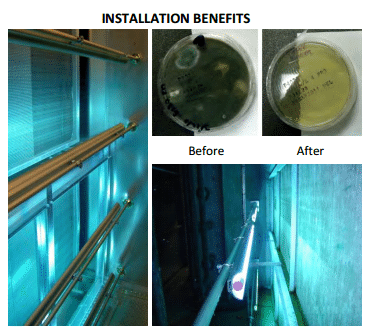 OPERATION: Prolonged exposure to UV radiation will keep the air conditioning coil clean and free of bio-contaminants, including viruses, fungi, bacteria & bio-film that may grow on the coil. Maintaining a coil free of microbial growth will maximize the efficiency of coil heat transfer and reduce the hours of operation of the compressors, resulting in lower energy costs. UVC GERMICIDAL PRINCIPLE: – The 254nm UVC wavelength is well documented for its germicidal properties. The effects of ultraviolet radiation on biological contaminants have also been included in the latest ASHRAE Handbooks. Generally, this relationship is similar to the absorption curve of nucleic acid (DNA) the basis of all living organisms. The germicidal destruction rate for any specified bio-contaminant can be greater than 99.9% as the maximum UV intensity produced by the UV lamp is directed onto the coil and each application is sized according to its requirements.